A list of all Carnoustie Hotels in Scotland with Websites, Phone Numbers, Images and links to Maps and Reviews. Carnoustie Area Attractions Click On Map. Also listed are links to B&Bs and Self Catering. 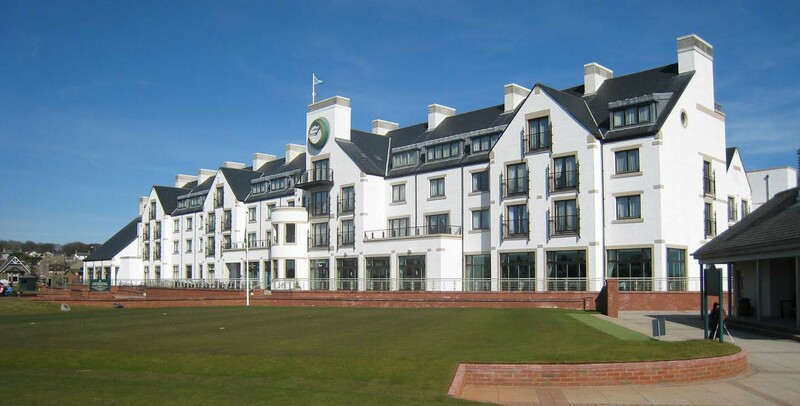 Carnoustie Golf Hotel & Restaurant AA 4 Star, 0.5 of a mile south of Carnoustie centre on The Links. For luxury golfing, leisure and conference facilities, the Carnoustie has 75 en-suite bedrooms, with ten suites having views over the Championship golf course and sea. Tel: 01241 411 999. 19th Hole Hotel SC 4 Star, 0.5 of a mile southwest of Carnoustie centre on Ferrier Street. All accomodation is modern having undergone a major refurbishment in 2011. Tel: 01241 852 108. Aboukir Hotel Bar & Restaurant SC 3 Star, 0.3 of a mile south of Carnoustie centre on Ireland Street. Offering an excellent bar restaurant and spacious bedrooms, all en-suite. Tel: 01241 852 149. Station Hotel SC 3 Star, in the centre of Carnoustie on Station Road. A traditional family run hotel offering comfortable en-suite accommodation, fantastic food and a warm welcome. Tel: 01241 852 447. Kinloch Arms Hotel & Restaurant SC 2 Star, 0.3 of a mile southwest of Carnoustie centre on the High Street. Eight comfortable, en-suite bedrooms with Sky Television and a hospitality tray. Tel: 01241 857 008.